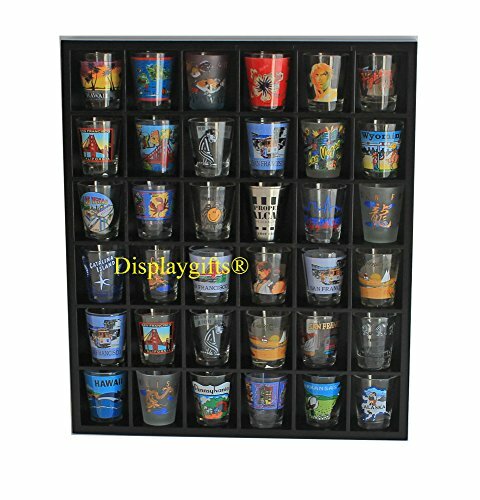 Our Wood Shot Glass Wall Curio Display holds up to 36 jiggers! 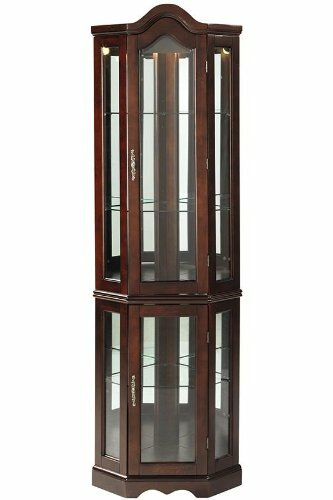 Store and display your collection in this handsome showcase-it's the perfect shot glass holder. 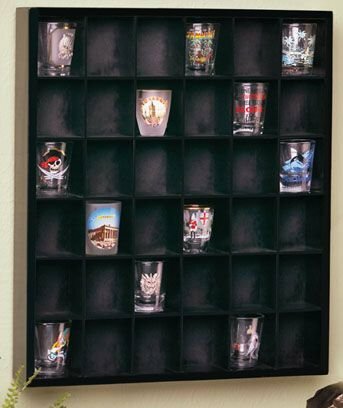 Attractively finished wooden rack has 6 shelves for showing off your favorite shot glasses. Mounts easily on wall with included hang hooks. Each cubby is 2-1/2" x 2" x 2". Measures 16.5" x 14.25" x 2.25" Color Black. Holds 72 regular shot glasses. Every in between shelf can be removed to accommodate tall shot glasses or shooter shot glasses [7 wooden shelves (4 removable in between) ]. 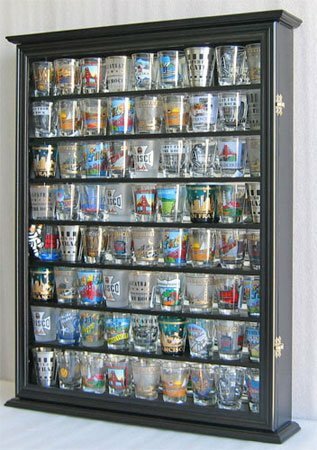 This would be a excellent gift for shot glass collectors. A great way to showcase collections. Made from hand selected fine quality hardwood by our experienced craftsmen. Surface is sanded repeatedly to make it smooth and elegant. Mirrored Background to create a lovely display. Brass hinges and door latches. Wall brackets to hang (wall mounted). Anchors for extra weight support included. UV Protection Acrylic door to protect from dust and damage. Dimensions: 24.5"H X 19.5"W X 3.5"D Weight (net): 18 lbs Space between rows: 2.5" Interior Depth 2.25"
It is so beautiful. Made of Natural crack-proof hardwood. 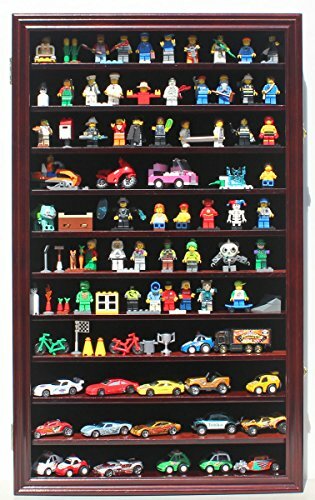 A great way to display minifigures, hot wheels collection, and miniature action figures. 11 shelves with 5 of them removable (in between) to accommodate taller items. Fine fabric matted background to create a elegant display. Sanded repeatedly to achieve unmatched smoothness surface and fancy appearance. Holds 60 Hot Wheels (regular size). kid-safe acrylic door to protect from dust and damage. Wall Mounted (bracket installed in the back for hanging). Dimensions: 26.5"H X 16"W X 3.25"D (outside), Interior: 15.25"W, 2.3"D space between rows: Top row is 2.2"H, 2nd to 12 rows are 2"H, With one shelf removed in between every 2 rows the height is 3.75"H on the top row and 3.5"H for the rest. Weight: 13 lbs. 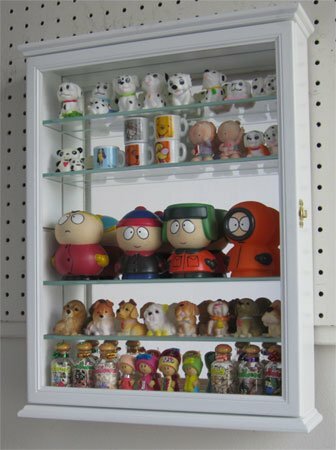 This display case has 41 individual slots for each item. 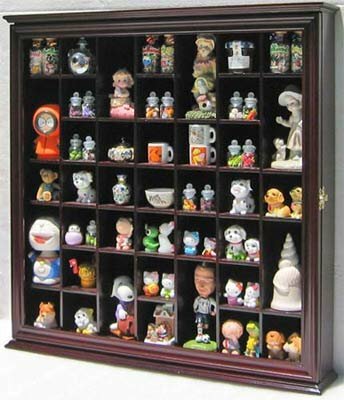 A great way to display small curio, figurines, rocks or other miniatures. Black Felt background to create a lovely display. Brass hinges and door latches. Wall brackets on the back for hanging (wall mounted). Can also stand on top of table. Glass door to prevents dust and damage while giving easy access. No assembly required. Overall Measurements: 21.5"H X 18.75"W X 3.6"D. Measurements for Small Slots: 2.25"H X 2.1"W X 2.25"D, Tall Slots: 4.5"H X 2.25"W X 2.25"D. Please measure your collectibles before buying. 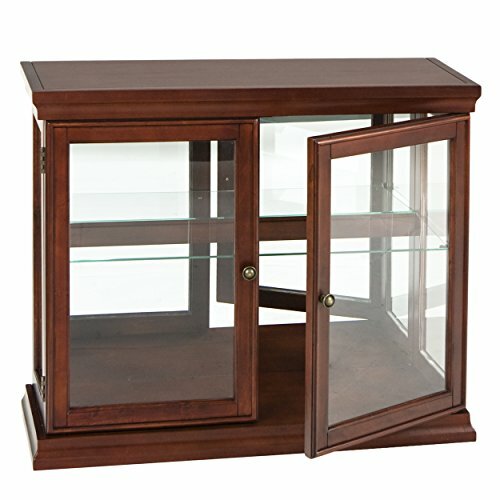 Compare prices on Curio Display Case at ShopPlanetUp.com – use promo codes and coupons for best offers and deals. We work hard to get you amazing deals and collect all available offers online and represent it in one place for the customers. Now our visitors can leverage benefits of big brands and heavy discounts available for that day and for famous brands.